Grace Church, a Grace Brethren congregation in Lititz, Pa., is the site for a debate on Thursday. “We are honored to host this debate,” says Pastor Ivanildo Trindade. One of the participants, Ryan Aument, is a member of Grace Church at Willow Valley, a Grace Brethren church in Lancaster, Pa. (John F. Smith, pastor). Below is an article about the event from Lancaster OnLine. Click here to read the complete article. 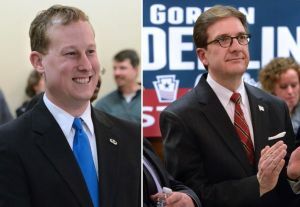 Republican state House members running for Lancaster County’s open state Senate seat will meet Thursday night to debate the issues facing Pennsylvania. State Reps. Ryan Aument and Gordon Denlinger will face off in a 90-minute forum being held by the Lancaster County Chamber of Commerce & Industry and Lancaster Newspapers. The forum, which is free and open to the public, is being held at Grace Brethren Church of Lititz, at 501 W. Lincoln Ave. It begins at 7 p.m.
LancasterOnline will also live stream video footage of the forum on this page. You can watch the event beginning at 7 p.m. below.